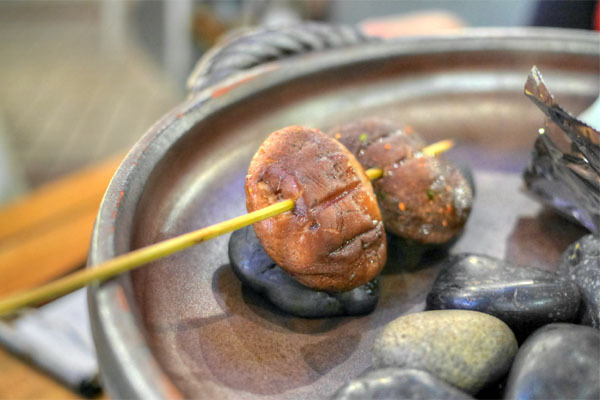 One of the more interesting concepts to open up in Taipei in recent years is Addiction Aquatic Development (AAD), a multifaceted project by the Mitsui Group (they run a number of high-end Japanese places around the City) that opened back in 2012. 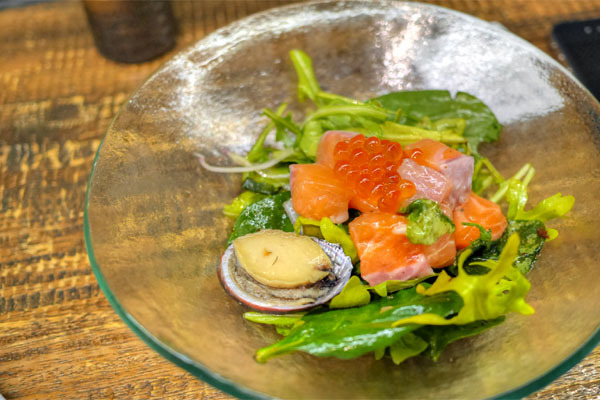 The goal of the 21,000+ square-foot space was to revitalize the local fish market, and to that effect, they've converted an old building into a sleek, upscale, wood-swathed space that has quickly become one of the places to go in Taipei. Addiction is nominally divided into ten distinct areas. 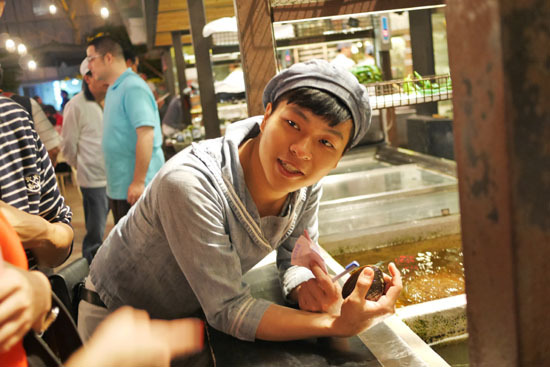 You enter through a large room holding dozens of live seafood tanks. 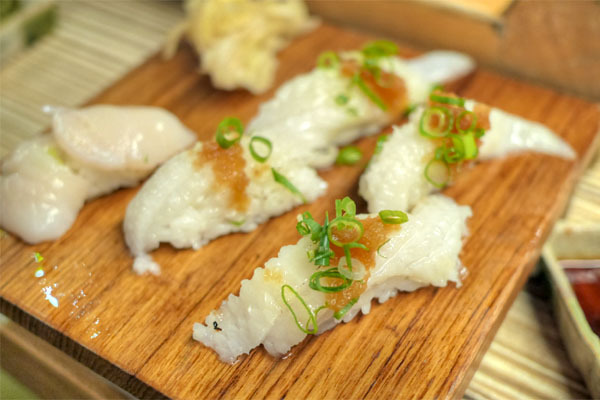 Product here is available for purchase, and can even be cooked for on-site consumption. The most popular section by far is the sushi counter, which is, oddly-enough, standing only, as is the raw bar in the back. 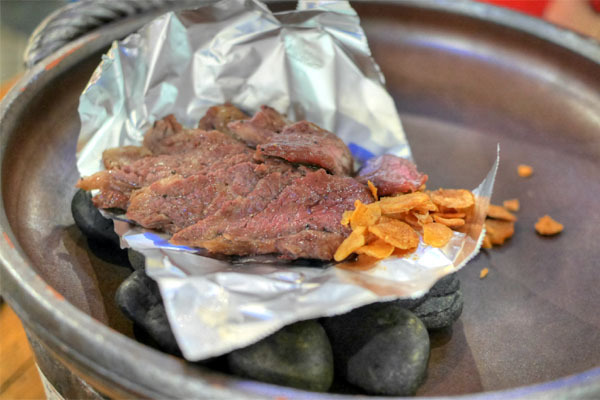 You also have the hot pot restaurant, which is the only spot that takes reservations, as well as an outdoor charcoal grill, which sometimes has live entertainment. The largest area is the market, where you can buy produce, meat, booze, prepared sushi to go, and even desserts. Wrapping things up are the hot food station, a boutique with kitchen ware, books, and other "lifestyle" products (along with an adjacent wine bar), a fruit stand replete with smoothies, and a flower and plant shop. The sushi area was a bit of a mess, so we took a number (actually two, #473 and #491) and headed over to the raw bar (shown above). 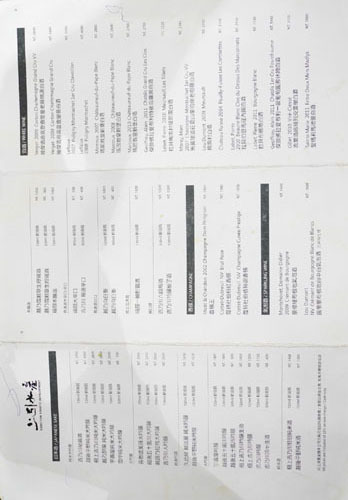 Here's the menu and wine/sake list for the raw bar. 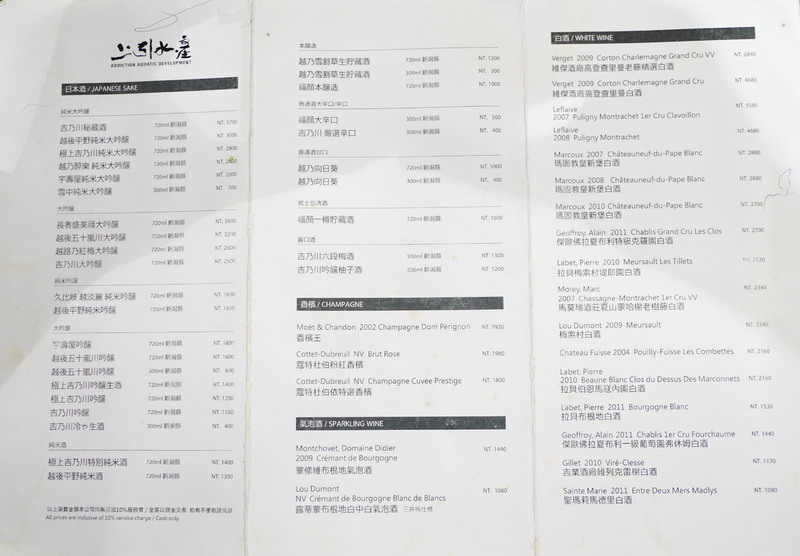 It is interesting to note that the selection of wines is exclusively French. 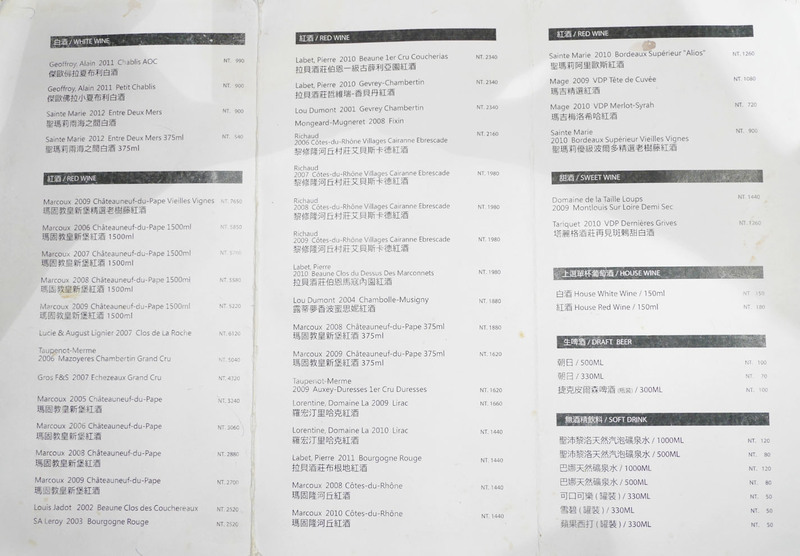 Perhaps there's still the perception in Asia that wines from France are inherently superior? Click for larger versions. 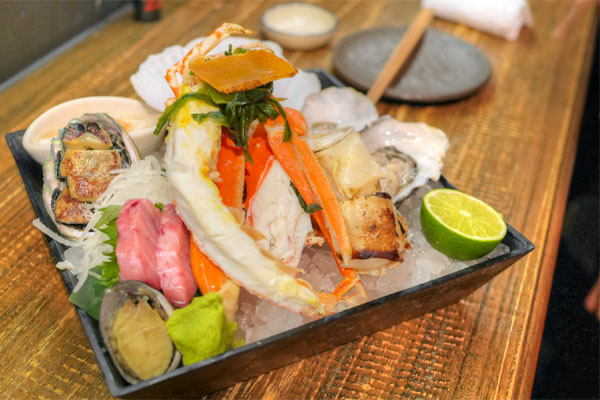 We ended up getting an Assorted Seafood Platter [NT$1280] to share, which had a number of items including hairy crab, king crab, two types of abalone, prawn, tuna, salmon roe, mullet roe, scallop, oyster, and a salmon sashimi salad. It was a nice spread, and I was particularly fond of the abalone and sweet, succulent shards of crab. 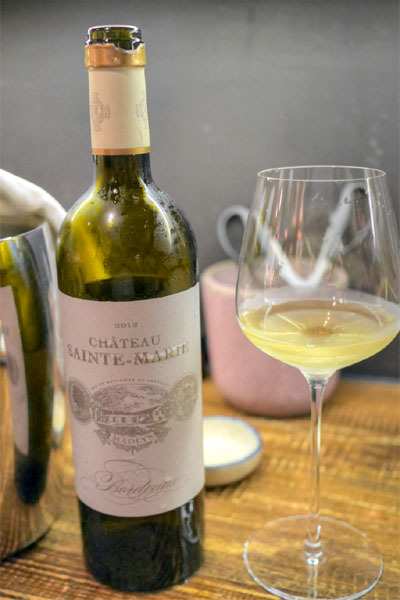 And to drink, a bottle of Sainte Marie 2011 Entre Deux Mers Madlys [NT$1080], a light, refreshing Sémillon-Sauvignon Blanc blend that worked wonderfully with the seafood. Given that our number(s) still wasn't up, we wandered over to the wine bar, bottle in tow. After a while, #491 came up on the screen. However, this wasn't an invitation to actually get into the sushi area, but rather a call to peruse the menu and order(?). We had to endure another 20 minutes or so of being crammed together before being let in (ostensibly through our #473 ticket). The entire experience was far more stressful than it needed to be. 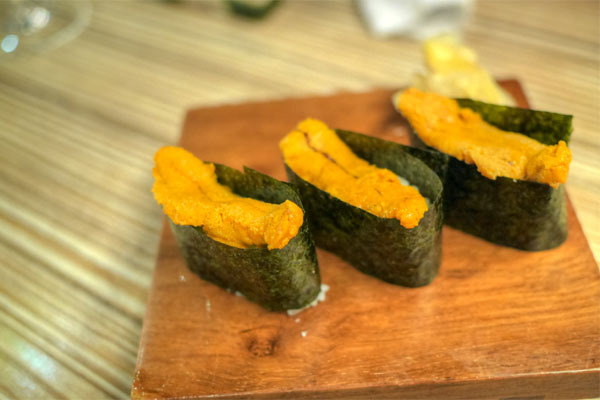 Upon being "seated," we had some uni to start. Not as lush or as creamy as what you may be accustomed to in the States, but still good. 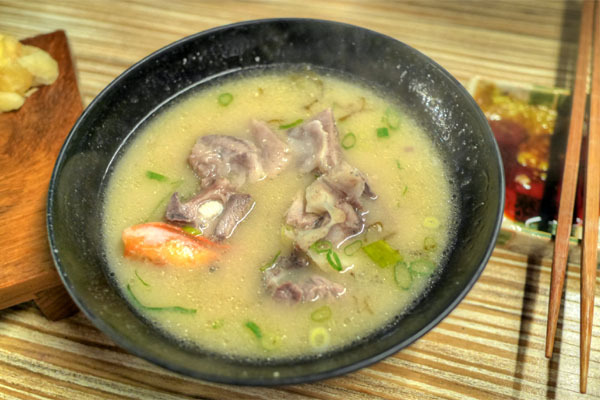 Our sushi platter also came with this earthy, umami-laden seafood miso soup. Pretty tasty, though a touch oily. 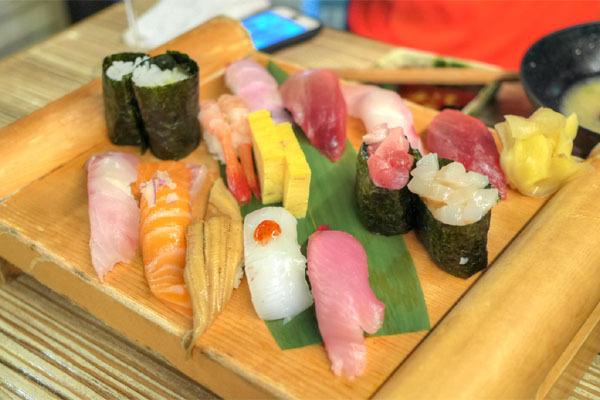 And here was our sushi plate (NT$600), comprising 10 pieces of nigiri, two gunkanmaki, two hosomaki, and tamago to close. I didn't get to sample everything, but what I did try was solid. And now for what I believe was halibut, as well as some scallop. 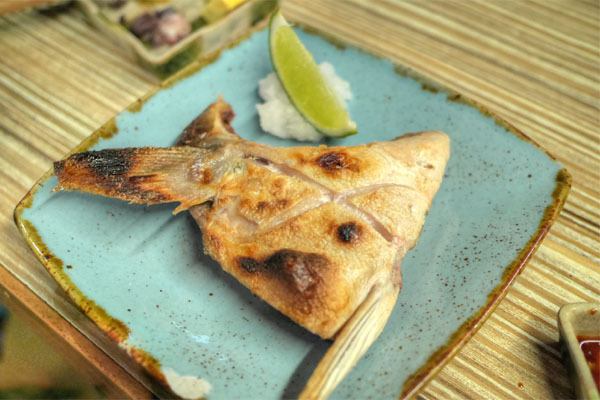 Some tasty grilled yellowtail collar to end our time at this station. Onward to the outdoor grill, probably the most festive area in the AAD. 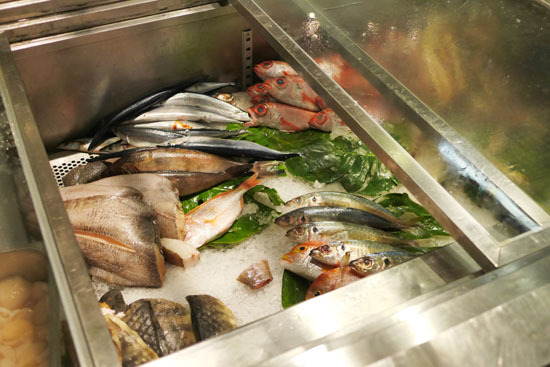 After being led to our table, we were taken to the seafood tanks to make our selections. 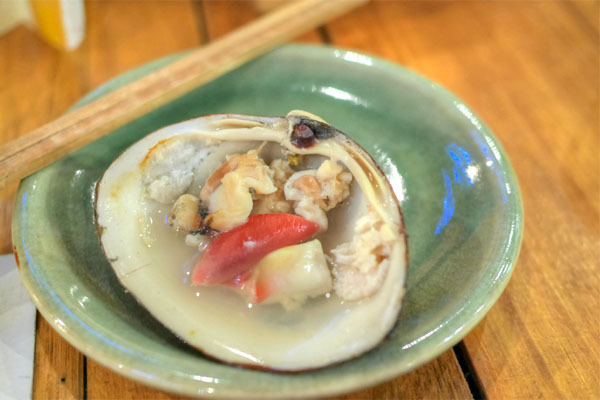 First up, some pricey, briny clams. And some nice cuts of beef, replete with crispy garlic chips. 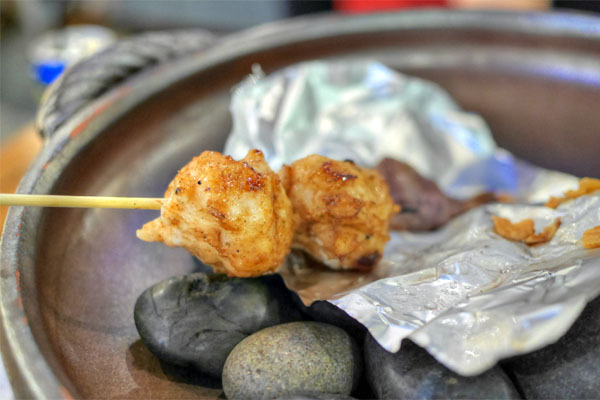 Squid balls were delightfully springy, with a great savor to 'em. 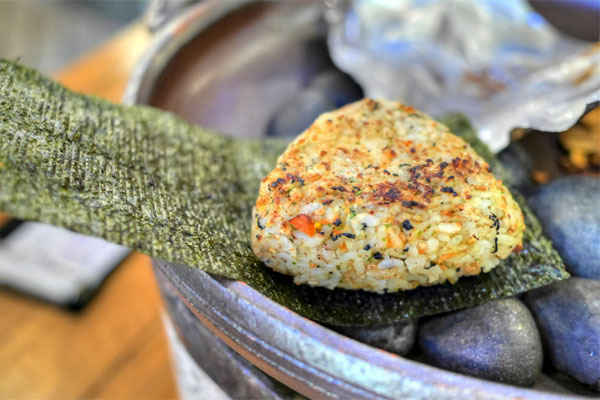 A hearty onigiri-style rice ball. And finally some juicy shiitake mushrooms to close. Logistically, I think there's room for improvement here, especially given the scale of the place and the resources of its operators. That being said, the actual food was quite good, and I'm a fan of the whole concept as well. Is there anything like it in LA? At .33 to the dollar, prices are very low. Hard to do that in LA or NY I would imagine for such fresh fish..
surprisingly decent pricing on some of the wines at the current exchange rate! It's great to see you post review of restaurant in Taiwan. Just like a cure for my homesick! Allan: More like $0.033 to the dollar. That being said, the prices weren't all that cheap. 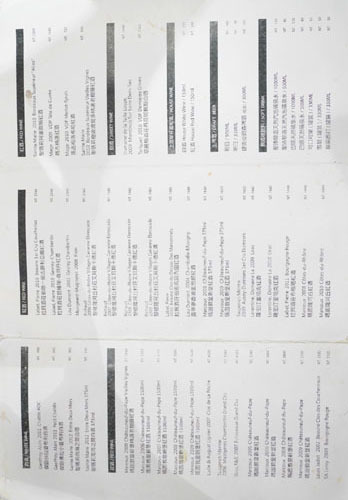 For example, that seafood platter was $42, about what you'd pay Stateside. Charlie: How's the overall selection thought? Charlie: No problem. I'm surprised you don't have any Taiwan reviews yourself. Joan: Indeed, I agree that the uni certainly among the best I've had. It was decent though. As for the grill, it seems like a more night-time sort of venue anyway, with the live music and somewhat festive atmosphere.